On April 22, 1809, Samuel was born to Sam and Mary in the shadow of the Bush Mills (Antrim, Ireland), a whiskey distillery, so apparently they lived very close to be in the "shadow". After his arrival in 1829, Samuel found work on the Erie Canal, building and digging. Later, he was a lock tender at Mauch Chunk (now Jim Thorpe), Pennsylvania where he met and married Mary Youells/Yowells. 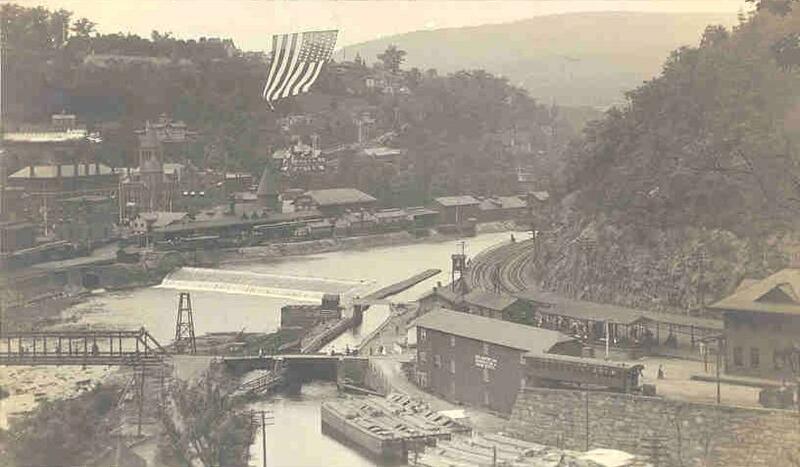 One evening as it was time for him to go back across the canal (I believe this was in Mauch Chunk), his little 3-year-old son Willie came running to meet him, across the top of the canal. The little boy fell into the canal and ruptured his spleen and died. After that, Mary refused to live there anymore and so the family moved to Illinois. There Grandfather Samuel (affectionally called "Pappy" by his grandchildren) bought a farm near Kappa, but north of the Machinaw River, where they lived in a log cabin. Cora Glass says that her grandmother, Mary Yowles was Pennsylvania Dutch. However, if you look at the census at the bottom of this page, it shows Ben's mother as being from Prussia. It is more likely that she was Pennsylvania "Deutsch", a common mistake. Mary was born about 1825 (she was 35 in the 1860 census in Palestine, Woodford, IL) in Pennsylvania and died October 15, 1876 in El Paso, IL and is buried in Kappa. The name "Youells" is also an Irish name. After Mary died, Samuel remarried to Mary Cleary Hurley, a widow. Emma Glass was born about 1842 in New York. She married March 17, 1863 in McLean Cty, IL to Michael Long and is buried across the Mackinaw River near El Paso. Mary Elizabeth Glass born February 2, 1889 in NE, died September 11, 1931. She married Sam Beavers, Jr. (1876-1959). Nellie Charlotte Glass born September 12, 1890, died December 1975. Edward Samuel Glass born March 16, 1892, died April 24, 1892. Samuel Glass married second to Mary Cleary on August 08, 1869 in Bloomington, IL. She was born in 1834 in Ireland and died February 28, 1914 in Gridley, McLean, IL. She was previously married to John Hurley and had 3 children. Edward T. Davis born October 16, 1893 in Williams, Hamilton, IA. John Charles Davis born August 4, 1897 in Iowa, died November 26, 1952 in Lowell, Lake, IN. Hyacinth Mary Davis born August 1898 in Illinois. William George Davis born August 1904 in Chicago, Cook, IL. Margaret L. Davis born August 10, 1904, died October 9, 1993 in Crown Point, Lake, IN. She married Edwards S. Schmal. Thomas Glass Davis born August 10, 1904 in Chicago, Cook, IL. These are memories collected from the older Glass family by Edna and Cora Glass. Mary Yowles Glass was very thrifty. They raised sheep, geese, ducks and chickens along with their garden. The women all wore long dresses, and Mary wore a belt with a bag attached to each side. When she was out, she would pick the sheep wool off the bushes, weeds, and fences, and put it in one bag. Then she would pick up the goose feathers and put them in the other. She spun the wool for stockings, mittens, and caps, and the feathers were used for pillows, quilts, and comforters. In those days, fruit was mostly dried for winter. In the spring after the crops were in, Samuel hunted work, as there was very little cash. He worked helping build the railroad in the West, and was there when they drove the golden spike. Most men who did not have much land, had to work away from home, and so the mothers were left alone for many months with the family. His older brothers and sisters helped them with the plowing, and the rest was done by hand, the hoeing, and weeding. All the children had to help. The boys all slept in the loft of their cabin under a bear skin. The snow would sift in through the chinks in the cabin roof during the winter, and they would wake up covered with snow. In his later years, Samuel lived with his son Benjamin. Benjamin, and his sons always called Samuel "Pappy", instead of Dad or Grandpa. Samuel Glass owned several different farms through the years and would buy and sell at a profit. He owned land in Marshall County and also near Kappa in Woodford County. At one time they lived south of the Machinaw River, near Kappa when Samuel's first wife Mary died. The death of Samuel Glass occurred Sunday, January 17, 1892 at the age of 85 years. He was one of the oldest residents of this county, having come here from Pennsylvania in 1854. He was an Irishman by birth, but had lived in the United States since boyhood. He had lived at Kappa for over 20 years and leave 3 daughters there now. One son, Robert, lives at Colfax and another, Benjamin at Panola. The interment took place at Kappa on Tuesday. Also a grandson: Dennis Sharpe born July 6, 1877, died Mar. 3, 1882. This history was taken from a letter written by Cora Sands on December 3, 1980 and has been edited somewhat. El Paso Township 1870 Census — This census suggests that there was possibly one more generation. Also, the name "Ann" as a second wife is new information. The birth year for our Benjamin and the fact that the siblings match Ben's make this the correct Samuel as far as being Ben's father. However, it suggests that the Samuel (Sharpe) Glass born in 1809 may have been an Uncle or other relative. Was our Samuel's father actually Robert (Sharpe) Glass and he obviously had to be born before 1809! According to the 1900 census taken in Jefferson Township, Scotland County, Missouri - Harry S. Glass who was born June 1864 in Illinois and whose parents were born in Illinois and Pennsylvania was married to Allie born March 1875 in Missouri.and whose parents were born in Ohio and Missouri. No children at that time. Could this be another son of Samuel and Mary? His birth year is the same year as Mary Yowles Glass's death. Was Benjamin's son, Harry Glass, named for this possible uncle? For information on the Glass Clan,click here.